Betfair offer a comprehensive array of sports both on the exchange and the sportsbook. Being a European based site, soccer coverage is extensive, with many markets being offered on each individual game, and betting is available on games of all levels worldwide. The main professional sports leagues in the US have a very wide selection of markets on each and every game, and the site is impressive at offering all sports, both popular and niche markets. One of Betfair’s key strengths is their horse racing service – all races worldwide are offered, many with an accompanying live video feed. Betfair led the way in live betting, and their live betting offering is industry leading – the sportsbook offer live odds on a wide range of sporting events, the exchange covering all of this and more with live betting on horse racing from start to finish. I strongly recommend keeping an eye on the promotions when there are big sporting events ahead – these can be the best you’ll find anywhere online. Check out www.betfair.com now for the latest offers! When you first see the Betfair site you will be greeted with the sportsbook, a lively page with lots of information. The sporting highlights of the day are offered on the front page as well as clickable links to popular markets, navigation to the market you want is quick and easy, and your betslip will appear on the top right hand side of the page. There are clickable links to other parts of the site at the top of the page, offering the exchange, poker, casino, arcade and various other games. Upon entering the exchange, you are greeted with a different color scheme to help differentiate between this and the sportsbook. There is one-click navigation to many popular markets, including every UK horse race and a straightforward menu down the left hand side to navigate to other sports/events. 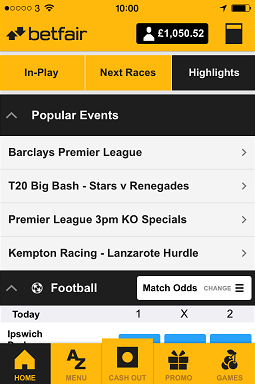 Betfair have an impressive range of Apps, currently eight covering all of their platforms. There are specialist apps available for both the sportsbook and the exchange, as well as poker and various casino and games offerings. The site also offers bonuses on a good range of popular one-off events – for the latest offers check www.betfair.com. With Betfair’s great standing in the industry you’ll have no problems with any of your financial transactions – a great track record combined with excellent customer services make this site an ideal safe and secure betting environment. Betfair offer an extensive range of deposit options. Traditional debit and credit cards are the most popular method, however the site also caters for deposits with Paypal, Neteller, Skrill, Ukash, Paysafecard, Skrill/Moneybookers and Western Union. There is also the possibility of moving money onto the site through a bank transfer or a cheque. When making a withdrawal from the site you’ll be able to withdraw to the method you deposited with, which is quick, easy and straightforward. If depositing via Paysafecard or Western Union, you’ll choose one of the many other withdrawal options. 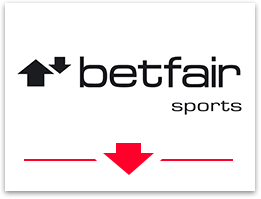 Betfair entered the gambling arena with a fresh innovative approach, and the site has maintained that attitude over the years, with a finger firmly on the pulse of latest betting moves and trends – in many cases instigating these themselves. With Betfair, you have the great scenario of having a choice of sportsbook or exchange, meaning that virtually any type of bet you want to place will be covered – and all of this is available at home or on the go with their impressive apps offering. As you would expect with any industry leading site, Betfair have a great reputation which they have built up quickly considering their relative youth in comparison to some other leading UK based bookmakers. The site offers both a great signing up bonus and attractive up to date offers to keep existing customers satisfied with free bets and bonus cash amounts.